This tournament is in its third year and is the brain child of Betsy Shepherd of Connected Communications out of Chicago Illinois. Betsy wanted to show her respect to first responders by providing an atmosphere where they could relax, relate and have a good time with other first responders who had experienced tragedies in their cities and departments. Then just to mix it up, she thought it would be a good idea to throw in a mixture of actors and sports figures who also wanted to show their respects to first responders! When you mix all of that together you come up with the Canal Shores Celebrity/First Responders 3rd Annual Golf Tournament hosted by actor Joel Murray and one heck of a fun weekend. Our Executive Director Ray Somberg was invited to attend in addition to representatives from the Omaha Police Department including Sgt. Jeffrey Kopietz. Sgt Kopietz was responsible for returning fire and stopping the suspect that killed Officer Kerrie Orozco while they were serving a felony warrant on a dangerous suspect. Also with Sgt. Kopietz that fateful day was Officer Bob Laney. Officer Laney was also fired at by the suspect as he stood by Officer Orozco. She was struck but he was not. The third officer invited was Officer Chad Schroeder. Officer Schroeder rode in the ambulance with Officer Orozco and let her know it was “okay to go” and that they would take it from there and take care of her family for her. Shortly after her death, Officer Schroeder wrote the “3 Minute Ride,” a poem in which he wrote about his grief and heartbreak that reached over 10 million views on Facebook. Our Omaha officers were joined at the tournament by officers and firefighters from Chicago, New York, Sandy Hook, Boston and others. Combined, the tragedies that these officers experienced firsthand are incomprehensible to the average citizen. 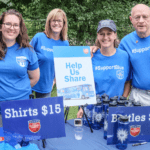 Although this group was born out of tragedy, they came together for a good cause and we were invited to honor Officer Kerrie Orozco and talk about #SupportBlue. Here in Omaha, we know that people look to the #SupportBlue campaign as a way to recognize and show support for our brothers and sisters in law enforcement who put their lives on the line for us each and every day to make the community a better, safer place to live, and judging from the reaction to #SupportBlue in Chicago and the representatives of so many other states, it is clear that the nation is hungry for this type of movement. 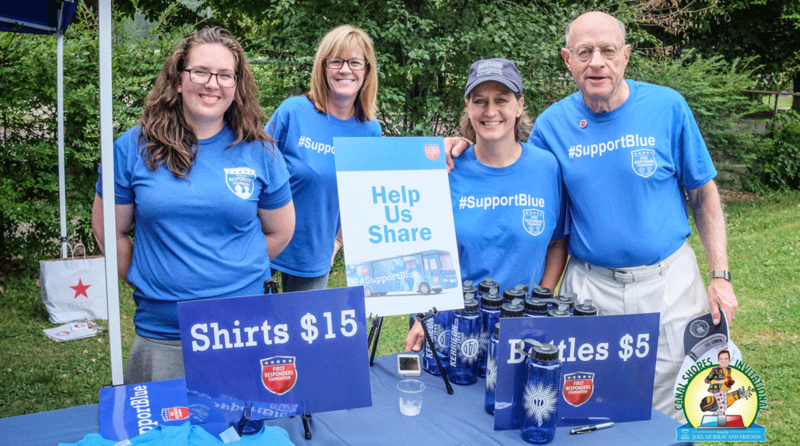 Aside from talking about #SupportBlue, we also were invited to set up a blackjack table for the golfers to stop by and raise funds to help #SupportBlue travel the country. We were treated like royalty during our trip and we met many new people who now have a way to publicly show their support for our law enforcement officers and #SupportBlue! Thank you Betsy Shepherd for finding such a great way to honor the men and women who are always there for us when we need them! We look forward to next year!